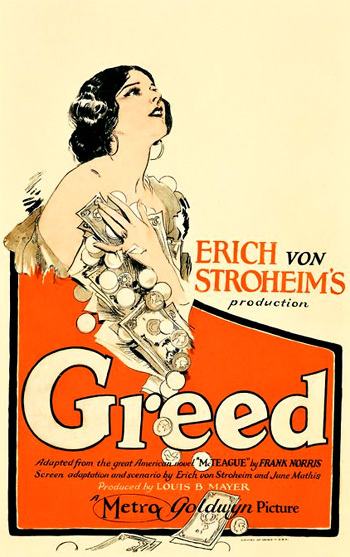 Greed (1924) is one of the greatest silent films ever made, although the film was a box-office failure at the time. The 'lost' film masterpiece is a dark study of the oppressive forces that decay and corrupt three people - a simple, uneducated former miner and dentist (McTeague) in turn of the century San Francisco, his miserly, vulgar and pathological wife (Trina), and their mutual friend and McTeague's ultimate nemesis (Marcus) - all are caught up by their squalid, debased passion, compulsion and greed for gold. The wife's fixation on money causes the dentist to lose everything - he kills her, becomes maddened with the same lust for gold, then takes flight only to find himself handcuffed to his dead pursuer in the fateful conclusion. The film is a morality tale about how the characters are dehumanized by the influence of money upon their lives. The film's elaborate script, adapted by June Mathis and Von Stroheim himself, was taken from Frank Norris' naturalistic, best-selling epic novel McTeague: A Story of San Francisco (written when Norris was twenty-three in 1895 and published in 1899). But the original tragic tale was modified - the pre-1906 earthquake plot was updated to begin in 1908 and covered a fifteen year period (until 1923). Since Von Stroheim was determined to accurately recreate and recapture every detail of every single page of the source material, the film became very complex and grew to unacceptable proportions. He also insisted on filming in natural, non-Hollywood studio locales - using real exteriors in the Sierra Nevada mountains, and interiors and street scenes in San Francisco and in Oakland. And he filmed the final fatal confrontation and shoot-out sequence in the sweltering heat of Death Valley under the very harshest conditions. Greed, still a powerful masterpiece, is only a truncated fragment of its original form that was first presented to the Goldwyn Company (the first cut was 47 reels, the second cut was approximately seven hours and 42 reels long). It is most noted for the director's struggle with Irving Thalberg at MGM, the studio that eventually released the film and wanted it to be of acceptable, commercial length. [A reel is approximately ten to twelve minutes in length.] Although Von Stroheim cut the film down to about 24 reels (a four-hour version), Stroheim's own director/friend Rex Ingram cut the film further to between 15 and 18 reels (a three-hour version). It was edited even more - the current release version of the film is now shown at approximately two and a quarter hours (about 10 reels), one quarter of its original length. The severe editing was completed by Joe Farnham and June Mathis, Goldwyn's story editor, who hadn't read either the book or the screenplay. Reportedly, the 32 reels of edited negatives were melted down by MGM to extract the valuable silver nitrate from the film stock. Gold-related objects in the black-and-white film (i.e., gold coins, gold plates and vessels, gold tooth fillings, a giant gold tooth, a brass bedstead, gilt frames, the birdcage, the canary, and gold itself) were hand-tinted frame-by-frame in the original release prints. But the original print of the film has been lost forever, although there have been repeated rumors of its existence. A restored, four-hour version was recently reconstructed by film archivist Rick Schmidlin - he pieced together existing footage and 650 stills with the use of the continuity script to create a fuller sense of Stroheim's original film (with its numerous subplots and complexities). I never truckled; I never took off the hat to Fashion and held it out for pennies. By God, I told them the truth. They liked it or they didn't like it. What had that to do with me? I told them the truth; I knew it for the truth then, and I know it for the truth now. The credits announce, in a signature style, that the film was "personally directed by Erich von Stroheim," and that the film was "dedicated to my mother." An iris opens and closes on a title card for The Big Dipper Gold Mine in Placer County, California, A.D. 1908. Bright and Yellow, Hard and Cold, Molten, Graven, Hammered, Rolled, Hard to Get and Light to Hold; Stolen, Borrowed, Squandered - Doled. The poetic verse is taken from Miss Kilmansegg: Her Moral by early 19th century writer Thomas Hood. The film opens with an iris-in long shot of the tree-covered mountains of California's gold country (Placer County), filmed in documentary style. A mine building holds a giant, twenty-stamp ore-crushing machine, where men shovel up muddy substances with a trowel and inspect for gold. A rail-car is pushed out of a mine, where young McTeague (Gibson Gowland), a car-boy at the Big Dipper Mine, works with a candle in one hand. He inspects a large chunk of rock quartz, throws it on the car beside him, and cumbersomely pushes the rail-car out of the mouth of the tunnel. There, he spots a little lame bird on the ground in the middle of the narrow gauge rail-track. He picks up the feeble, wounded creature, tenderly examines it, and kisses it (in closeup) - revealing his more gentle impulses. McTeague proceeds further along the track with the rescued, injured bird in his hand. Another miner maliciously hits his hand and the bird is carelessly knocked away from his hand. Anger grows on McTeague's transformed face to reveal his more violent side. In a rage, he grabs the miner, heaves him up over his head, and tosses him off the track down into a ravine where he lands in running water. "Filled with the one idea of having her son enter a profession and rise in life...the chance came at last to Mother McTeague." By nightfall, a crowd has gathered in front of the saloon, where the dentist exhibits his art to an audience. He takes his forceps and jerks a tooth from the mouth of a Chinaman patient. With great pain and longing on her face, Mrs. McTeague approaches and gazes thoughtfully at her son who is in the crowd - she ambitiously imagines her son bettering himself and in the same position as the dentist administering a glass of water to the Chinaman and being paid. "His mother's ambition was fired...and Mac went away with the dentist to learn his profession." She is inspired to have her son take up the career of dentistry. In the next scene, the traveling dentist has agreed to take on McTeague as an apprentice. With his mother on the path, McTeague leaves the mining camp in the dentist's buggy. She takes a few steps toward the departing wagon. She waves goodbye and then is left standing there alone. With tears in her eyes, she stuffs her white handkerchief into her mouth - the wagon disappears and the iris closes down on the scene. "Mac learned dentistry, after a fashion, through assisting the charlatan...and, years later, on Polk Street in San Francisco, "Doc" McTeague was established." A vertical barn door camera effect opens on the corner of the Polk Street district in San Francisco - [it is at the corner of Polk and California Streets]. Two street-cars pass by in the street below, as Mac works (with his white dental jacket clearly visible through the bay window on the second floor of the building at the intersection) upstairs on a patient in the dental chair. When the door bell rings, the door to the office at 611 Polk Street opens, where McTeague's best friend Marcus Schouler (Jean Hersholt) and Marcus' cousin Trina (Zasu Pitts) are ushered in to take a seat while he finishes his work on Miss Baker (Fanny Midgley). Marcus has referred his cousin (and his romantic interest) Trina to the dentist - he brags to her about McTeague's strength: "Trina, Mac's the strongest duck you ever seen - - by damn!" To prove the point, he makes a fist and grips his own bicep arm muscle to demonstrate. Trina takes a look towards McTeague. Mac's bed-lounge area (his living quarters) adjoins his dental office, where Maria Macapa (Dale Fuller), the charlady "keeps Mac's place clean. She's cuckoo in the head." Maria approaches and holds out tickets towards them, asking: "Buy a ticket in the lottery?...Just a dollar." Marcus withdraws three dimes (thirty cents) from his pocket in his hand, but quickly replaces them, and then scolds Maria: "Go 'long with you! Lotteries is against the law!" She persists and persuades Trina to buy a lottery ticket: "-- the butcher in the next block won twenty dollars the last drawing!" Marcus picks his ear and nose, but Trina takes a dollar out of her handbag and purchases one of the tickets. Mac, old pal, I wantcha to shake hands with my cousin. Trina Sieppe. She's my sweetie! In close-up, his large hand squeezes her smaller one. Marcus cautions him: "Don't you hurt her too much, Mac...So long, Mac. I got to do some work yet...at the dog hospital. Don't do anything I wouldn't do...you know!" Trina sits in the dental chair for some dental work, explaining what happened to her teeth. McTeague places a bib on her, has her remove her hat, examines her mouth with a dental mirror, and then decides that some of her teeth will have to come out: "I guess I'll have to pull them three teeth and make you a bridge." In the film's first hint at her stinginess, she is upset and naturally distressed by the diagnosis: "Oh no! That will cost too much, won't it?" "For the first time in his life, McTeague felt an inkling of ambition to please a woman." He explains to Trina what he is going to do, assuring her that he will not hurt her. But below the fine fabric bred of his mother, ran the foul stream of hereditary evil...the taint of generations given through his father. Terrified at his weakness, McTeague threw himself once more into his work with desperate energy...until he finished. Marcus clowishly enters the office to retrieve Trina, following the operation. To enliven their ill-at-ease spirits, he enters with a hop and skip, closes the door behind him with his foot, and then makes an imitation of Napoleon (with his hat turned sideways, his coat closed, and his hand in the familiar pose). After looking at the repair job in her mouth, Marcus compliments Mac: "Oh, Mac's all right...by damn!" He playfully punches Mac in the arm. "Trina was to come no more." As Trina and Marcus walk toward the door, hand in hand, and say "So long," Mac watches them depart with a sense of loss, after being powerfully attracted to Trina. "His dream was gone." From his bay window, he watches them while they wait for (and then board) a streetcar from across the street. As the street-car travels away down Hayes Street, a closeup of his face shows tears streaming down his cheeks. Marcus: What's the matter with you these days, Mac?...huh? Mac: (after a long hesitation) It's...it's...Miss Sieppe! Marcus: (Agitated, he turns back toward Mac and extends his arms toward his friend.) Well...what are we goin' to do 'bout it? I'll give her up to you, old man - - by damn! (The two men shake hands together.) Friends for life - - or...death! Mac: I'm...much...obliged, Marcus. I'm much...obliged! "Then, with unselfish friendship for his 'pal', Marcus took Mac to Oakland the next Sunday...that he might again be with Trina and meet her folks." From a long shot filmed from above, their train approaches the 34th Street Station where the Sieppe family (with dog) is expectantly awaiting its arrival. "Mommer" Sieppe (Sylvia Ashton) carries a large picnic basket; the twin brothers Max and Moritz (Oscar and Otto Gotell) and kid brother 'Owgooste' (Austin Jewel) are dressed for the picnic outing and carry a butterfly net and a toy boat; and buck-toothed cousin Selina (Joan Standing). First, Marcus vigorously shakes hands with a spectacled, handle-bar mustached "Popper" Sieppe (Chester Conklin), who carries a Winchester rifle, has a chest covered with medals, and wears a hat with a small American flag. He then introduces the entire family to McTeague. Marcus: Mac, this is Trina's father! Mac: (They shake hands) Sure glad t' know ya, Mr. Sieppe. Marcus: Doc,...shake hands with my cousin, Selina. Marcus: Here's where we shell out, Mac. Gimme four bits! Mac: (After reaching deeply into his pocket and looking slightly embarrassed) I ain't got no money with me...only a dime! Marcus assures his pal that he will pay for everyone and buys their tickets at the ticket office. "What a day that was for McTeague...what a never-to-be-forgotten day!" Some of them go to the merry-go-round - with the camera on the platform itself, Trina and Mac ride two abreast. Behind them are Selina and Marcus (they go in and out of the sunlight during the ride - it alternates from dark to light). Popper visits the rifle range, aims his rifle at the shooting range target, and fires. He gets very worked up when a sign rotates and indicates that he has missed the target. McTeague is uproariously happy, slapping his thigh, laughing, and enjoying Trina's company. Trina: -- 'Hearts and Flowers'? Mac: No...but, 'Nearer My God to Thee'. Mac: Say, Miss Trina...why can't us two get married? (Trina responds with agitation and a surprised expression, wringing her hands in front of her) Why not? Dontcher like me well enough? Then...why not? As they embrace, a train roars past, and she struggles to free herself from his strong grasp. "First...chance had brought them face to face; now...mysterious instincts, as ungovernable as the winds of the heavens, were knitting their lives together." She pleads with him, pushes him away and gasps: "Let me go alone...please!" Then, noticing his hurt expression, she extends her hand: "-- you may...you may come Sunday!" He persists: "Can't I kiss ya again?" She refuses, withdraws and frees herself, opens her umbrella, and rushes from the station. As he stands in the rain and watches her go, his bewildered and stunned look changes, and a smile grows wide on his face. He exclaims madly, as he pounds his fist into his palm and realizes his good fortune: "I've got her! By God...I've got her!!" He hails down an approaching train and boards. Trina: I liked the lady best...who sang those sad songs. Mommer: I liked pest...der yodlers! Mac: I liked best...the fellow who played 'Nearer My God to Thee'...on the beer bottles. Agent: Your lottery ticket has won five thousand dollars! Agent: (reaffirming) On presentation of your ticket...you will receive a check for five thousand dollars! Mommer: Vat efer vill you do mit all dose money, Trina? Marcus: Come along, Mac. We've gotta sleep with the dogs tonight you know. What a damn fool I was - - if I'd a' kept Trina, I'd a' had...five thousand bucks! Damn the luck! "Trina and Mac were married a month later in the photographer's rooms that Mac rented for their future home." A closeup (an iris shot) of a white-gloved hand holding a wedding ring in a small square box opens the scene. As the camera pulls back, it reveals McTeague holding the ring in his office. Old Grannis (Frank Hayes) is seated nearby, performing the functions of best man.